· ✈ (The most suitable drone for beginners): buy one of the most interesting entry-level drones at the lowest price, it is believed that the H8 drone will bring you different flight experiences. · ✈ (3D roll function): A 360° roll key, continuous roll for perfect action and wonderful performance. With colorful flashing light, keeping your plane at night flying is quite excellent. · ✈ (Long Flight Time): Equipped with a high-performance lithium-ion battery, the quadcopter can stay in the air for 6-8 minutes on a single charge. The easy-to-remove battery can be replaced so you can buy additional batteries to extend your flight time. · ✈ (Night Safety Navigation): Equipped with LED lights on the front and back for night flights that look beautiful, helping you safely ride the quadcopter in unfavorable lighting conditions and leave a beautiful scenery in the night sky. 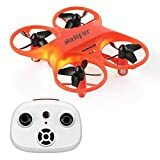 · Description: If your kids are asking for a mini drone enthusiastically, but they are in the learning stage of a drone, and can´t spend more of their budget, Helifar H8 Mini Portable RC Quadcopter can solve their purpose to fly indoors. It looks much smaller in size but actually has a lot of power inside, perfect for indoor flying as well as much easier to operate and control for beginners. Main Features: ✮ ANTI-COLLISION AND ANTI-BREAKING: The propellers and the body of the drone are protected by the shrouds. ✮ LED NIGHT LIGHTS: The drone features LED night lights forward and backward to provide a good night view, you can also see a curvilinear curve that the drone describes in the sky at night. ✮ AFTER SALES SERVICE: Do not hesitate to contact us directly by email, anytime and anywhere you have trouble. We are making every effort to solve the problem. Specifications: - Model: H8 - Remote control: 3 AAA batteries not included - Battery: 3.7V 200mAh - Flight time: about 6 - 8 minutes - Charging time: about 1 hour - Remote distance: 15 m - Function: up / down / left / right / forward/backward / 360 degree rotation / LED navigation lights Notes: - Do not fly the drone outside when the wind and rain are strong. - To extend the battery life, fully charge the battery before the first flight.